Based in Cambridge UK, Singapore, and Boston,USA, we run our International Knowledge Academy at Knowledge Associates Ltd.
We provide a wide range of knowledge management training and education programmes, both virtually, through the world wide web through e-learning and e-coaching, and/or face to face in classroom and campus, and a blend of both. We offer knowledge management certification and knowledge management consulting accreditation throughout. 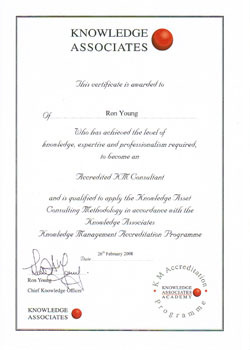 All courses are led by Ron Young and/or Knowledge Associates accredited training consultants worldwide. In line with our strong belief that 'what can be done through the web - will be done through the web', our mission is to reach, teach, coach, facilitate and consult with as many people as we can, online, around the world. For those who prefer the significant additional benefits of intensive and interactive 'face to face' discussions and debates, classes, seminars, workshops and master classes, we offer day and residential courses regularly in hotel venues in major cities around the world. We can also run all courses and workshops in-company, at your premises, as required. All courses can be run within your organization, and courses can be designed to meet your specific objectives, followed by a specific training report and recommendations. All the above training courses will be offered on-line during Qtr3 and Qtr4 2012. Please be sure to visit this page again shortly for further details. Please let us know your specific KM training and education needs or questions by completing the contact/feedback form below. If you have an urgent training and education need now, or you require further information about any of the above courses, please contact us directly by email, as below.